However, this store is not as successful everywhere as it is in the US and wasn’t really attractive in Germany and South Korea where it had to retreat. In total, Wal-Mart counts 8500 stores in the world. 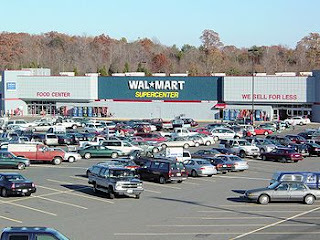 It is really famous: a study showed in 2005 that 20 millions of people walked into a Wal-Mart per day in the world and in 2010, Forbes proclaimed them the world's largest public corporation based on revenue. Wal-Mart covers a high range of products. When your enter a Wal-Mart store, your eyes may be caught by either jewellery, tires, groceries, toys, drugs,… Needless to say, everyone finds what he wants and even more than expected. Nowadays 2,100,000 people are working on daily basis for this firm. However, Wal-Mart has recently faced many accusations and problems with employees for different reasons. First, there seems to be gender discrimination regarding salaries and promotions. Indeed, after much investigation, it was affirmed that women were less paid than men. Moreover only 35% of management and high occupations are filled by women. They also have to deal with many other critics. Indeed, they sell products that are relatively cheap, which endangers all the neighbouring little shops. In their attempt to make the lowest prices, they are criticized for the fact that, in order to reach a low price, they have to spend the least on all the production processes. This may then result in worsening the situation in working countries where those products come from. Wal-Mart is a great obstacle to all the efforts of Fair Trade. Moreover, as a result of their 'less costy production', they do not seem to pay much respect to the environment issue. On a bigger scale than the popular demonstration on the street, television and cinema also deal with the Wal-Mart issue. In 2004, in the 9th episode of the 8th season, the heroes of South Park are discovering this supermarket's world in “Something Wall-Mart This Way” and quickly realize that it is not such a good thing. It is definitely a representation, and sometimes parody, of all the critics that have been raising against the store. In 2005 Robert Greenwald made a documentary about this huge firm: "Wal-Mart: the high cost of low price". The director is using interviews with former employees in order to criticize Wal-Mart. In the film, the same critics as listed earlier appear showing that Wal-Mart and its work policies are pointed out more than ever. But those three appearances in different videos are also the proof that Wal-Mart is really well-known and part of the culture in the United States.